Excellent Falafel... and Lebanese salad and the flavors ...Had the falafel wrap and the beef, chicken and lamb combo dinner.... are very generous -besides the entree, you get a side and soup or salad. crushed chick peas mixed with parsley, spices, and fried in vegetable oil. served with tahini sauce. order by the dozen or half-dozen. blended chick pears with tahini sauce, garnished with olive oil, parsley, and lemon juice. comes with pita bread. baked eggplant puree garnished with sumac, parsley, olive oil, and spicy lemon juice. crushed lentils blended with carrots, onions, and chopped parsley. a large basket of freshly baked fries. grape leaves stuffed with a blend of rice, tomatoes, olive oil, lemon juice, and seasonings. baked dough stuffed with spinach, onions, spices, and tossed in olive oil and lemon juice. cracked wheat stuffed with beef, onions, and spices. cooked fava beans mixed with tomatoes, onions, parsley, topped with olive oil and lemon juice. Adding Meat Will Be Extra. fine crushed wheat, tomoatoes, parsley, onions, spices, olive oil, and lemon juice. cucumbers, tomatoes, mixed greens, and parsley, tossed with olive oil, mint, and lemon juice. fresh spinach, cucumbers, tomatoes, black olives, and croutons. choice of side dressing. 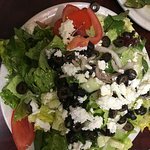 mixed greens, cucumbers, tomatoes, black olives, feta cheese, topped with garlic, olive oil, and lemon juice. cucumbers, tomatoes, mixed greens, and parsley, tossed with olive oil, mint, lemon juice, and fried pita bread. yogurt, cucumbers, mint, and garlic. tomatoes, cucumbers, and parsley mixed with tahini sauce. All Sandwiches Are Served With Jerusalem Salad, Lettuce, And Onions. crushed chick peas mixed with parsley, spices, and fried in vegetable oil, topped with jerusalem salad, hummus, and tahini. 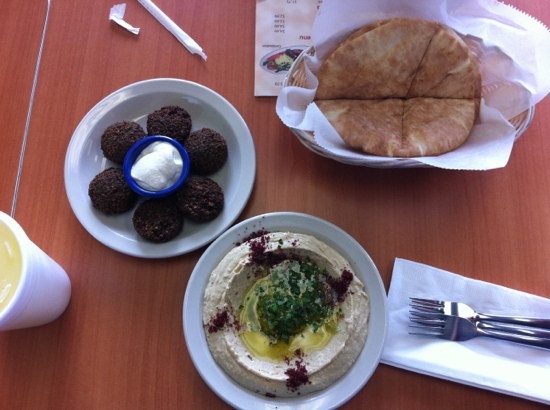 falafel, fried potato or eggplant, topped with jerusalem salad, hummus, and tahini. marinated lamb or beef charbroiled to perfection. chicken filet charbroiled to perfection. chicken filet in our special hot sauce charbroiled to perfection. 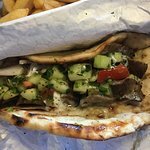 lamb and beef mix cooked on a rotisserie, topped with tzatziki sauce, tomatoes, cucumbers, and onions. 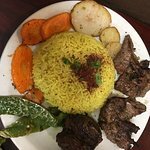 All Entrees Are Served With A Side Of Middle-eastern Rice, Fried Vegetables, And Choice Of Soup Or Lebanese (house) Salad Except The Vegetarian Plate. 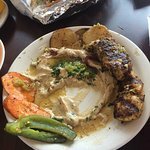 hummus, babaghanouj, tabouleh, falafel, and stuffed grape leaves. a blend of ground beef and lamb, with parsley and onions, charbroiled to perfection. chunks of juicy, marinated chicken charbroiled to perfection. chunks of marinated chicken with our special hot sauce charbroiled to perfection. chunks of marinated beef or lamb charbroiled to perfection. 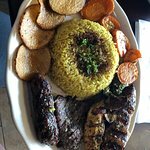 kifta, beef, and chicken charbroiled to perfection. marinated jumbo shrimp with our special spices grilled to perfection. brown lentils and rice with fried onions. 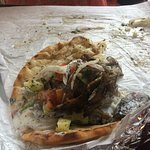 Lamb and gyro plates were outstanding. Portions were very generous and skillfully seasoned. Decided to visit for a late lunch. 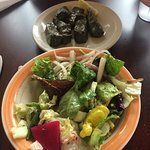 Grape leaves as an appetizer. #7 as my meal. This our third time eating here our last three years. And once again our meal was amazing. 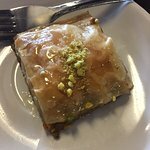 Oh and don’t forget the baklava for dessert. 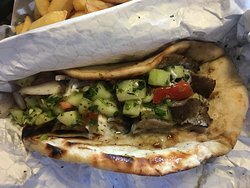 Small, simple strip mall eatery with absolutely delicious, authentic Mediterranean food. Wish we could go back and try everything on the menu! 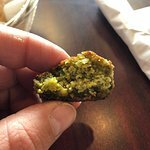 The tabouli and baklava were the best I've ever tasted! 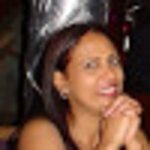 Get quick answers from King O Falafel staff and past visitors. Do you deliver to Disney resorts like the Disney art of animation resort? 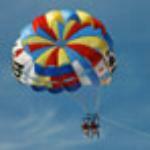 If not, what's the easiest way to get to your restaurant from the resort?